Eaton Corp. Has Bought Back $100 Million Worth of Shares So Far in 2016. Should Investors Be Happy? Eaton Corp. is buying back shares with plans for more, but is this a good thing? Eaton Corp. (NYSE:ETN) is a global industrial giant with a storied history. Right now, like so many in the industrial space, it's facing a sales slowdown. And it's decided to buy back stock -- a lot of it. Indeed, Eaton Corp. has bought back $100 million worth of shares so far in 2016, with millions more on tap. Should investors be happy with this stratgic move? There's no way to make Eaton's current predicament sound good. It's an industrial company facing a world that's slowing down. For example, the company's top line declined 8% year over year in the first quarter. Worse, an organic sales falloff accounted for 6 percentage points of that, with the rest made up of currency changes. For the full year, Eaton is looking for organic sales to drop as much as 4%. That suggests improvement from the first quarter, but it's still not a great business backdrop. Last year wasn't all that much better: Organic sales fell 2%. Faced with this situation, Eaton has decided to put some of its cash flow to work buying back stock. In 2015 it spent $682 million on buybacks. Add in the $100 million from this year and, in just five quarters, the company has spent nearly $800 million. But that's not even half of the plan. Eaton is looking to spend another $600 million through the end of this year, and a total of $3 billion between 2015 and 2018. The tough question surrounding share buybacks is always price. Is the company paying too much for its shares and, in the end, hurting investors? Only time will show the true answer, but Eaton appears to be spending wisely. 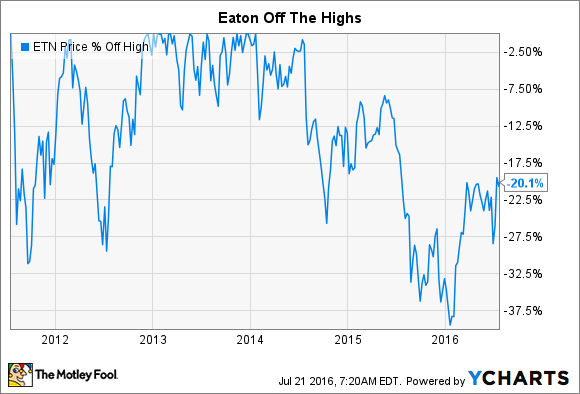 In 2015 Eaton's shares were trending lower all year long. By the end of the 12-month span, they had fallen as much as 35% below their late 2014 peak. Even today, after a partial recovery, the stock remains 20% below the 2014 highs. So you can't complain that Eaton is buying at the top, which is a sign of shareholder-friendly use of capital. Of course, the lower share count helps out earnings, too. But that's probably less of a concern over the near term than the prices being paid. You see, despite the weak market Eaton is facing, it still makes a lot of money. For example, in the first quarter, the company earned $0.88 a share, and it is expecting the full year to come in at somewhere between $4.15 and $4.45 a share. Are share buybacks helping support the earnings-per-share number? Yes. But it's a marginal impact, and Eaton isn't being shy about or trying to gloss over the troubles it's facing. So these buybacks appear to be more about returning value to shareholders today than "manipulating" earnings, though years from now the benefit to earnings could start to look much larger if growth picks up again. The other nice thing is that Eaton is throwing off a lot of cash. For example, in 2015 the company generated around $2.4 billion from operations. Capital expenditures ate up roughly $500 million of that, with dividends taking up another billion or so. That left roughly $800 million to cover the $680 million spent on share buybacks. In other words, Eaton generated more than enough cash last year to buy back its shares. This year's first-quarter numbers don't look quite as good, with cash from operations of $371 million, capital spending of $111 million, and dividends of $256 million. Thus, the $100 million spent on stock buybacks in the quarter had to come from other sources, like debt and/or cash on hand. However, Eaton regularly builds up working capital in the early part of the year, which eats up cash. That spending, on things like inventory, gets worked out over the rest of the year as its various businesses produce and sell/deliver products. So it's reasonable to expect the full year to look more like 2015, as far as cash flow is concerned, when all is said and done. Add in that Eaton's earnings projections suggest the rest of the year will be better than the first quarter, and there's added reason to be positive. Eaton appears to be shifting toward stock buybacks at a time when its shares are relatively weak. That's exactly the scenario you want to see when a company is buying its own stock. And if 2015 is any indication, Eaton has the extra cash to spend. So Eaton Corp. has bought back $100 million worth of shares so far in 2016, has plans to buy back much more, and investors should be happy about it.